Two by two, in a long procession a couple of hundred strong, the harvesters wended their homeward way, first the men carrying their cradle-scythes over their shoulders, then the women with their handrakes, and, finally, the children, all singing some merry harvest-song of their native country, while keeping step to the music. The harvesters belonged to the Swedish religious colony at Bishop Hill, a group often studied today for its religious theology, its struggles with the Swedish Lutheran Church, its importance as a Utopian settlement on the American frontier, and for the dramatic events surrounding its founder's murder in 1850. But the colony also merits attention because it marked the initial foray into Illinois of a Swedish immigration stream that quickly increased from the 1,123 Swedes counted in the 1850 state census, to 6,460 in Illinois by 1860, then exploded. By 1900 Illinois had almost 100,000 Swedes — second only to Minnesota's 115,476 in the United States. And this was but a small part of the total exodus from Sweden. By 1930 only Ireland and Norway had lost more citizens per capita than Sweden to emigration. By that year, the United States had 1.5 million Swedish-born residents, and one in five Swedes resided in America. 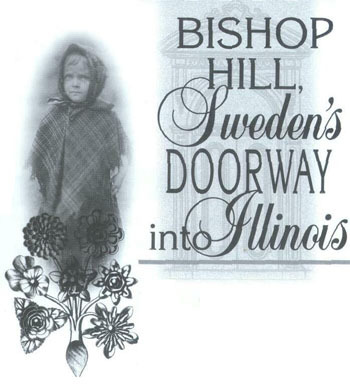 Historians of immigration agree that much of the Swedish exodus to Illinois and the United States can be traced to the impact of the flight of followers of Eric Jansson to Bishop Hill in 1846. They came from a land torn in the1830s and 1840s by religious and economic strife. The state Lutheran church had grown so rigid and doctrinaire that critics called it "a magnificent ice palace." Challenges were mounting against the church's heavy-handed control, and groups called lasare — "readers" — held secret meetings to discuss the Bible, free of the clergy's dictates. A religious revival gained momentum, powered by attacks on drinking, card playing, dancing, and above all on the state church. piles of religious books, challenging Swedish laws, and occasionally being thrown into jail. At that moment in Swedish history, when large numbers of citizens were frustrated by the controls of both church and state, reports began to arrive from across the ocean that pictured both America and Illinois as a paradise, a Utopia. Letters from the few early Swedish pioneers who had ventured into the Midwest extolled the Mississippi Valley's soils and America's religious and political freedoms. These and several newly published travelers' accounts often were quoted in Swedish newspapers and by street-corner speakers making attacks on the government. These developments churned in the mind of Eric Jansson, who in 1845 sent Olof Olsson to scout out Midwestern property for settlement by Jansson and his followers. Although Olsson initially planned to visit Minnesota and Wisconsin, a Swede in New York recommended the neighborhood around Victoria, Illinois, where his brother was happily farming the rich prairie. Olsson traveled to west-central Illinois and liked what he saw, eventually selecting a site in Henry County. It had running water and a grove of trees, but most of all it possessed rich soil unencumbered with rocks. Not only dissenters from Sweden were attracted to this region. Half of America's ninety-nine communitarian colonies in the1800-1850 period were founded on the Middle Western frontier, most originating not among local residents but from movements in the East or Europe. The Mormons at Nauvoo, and the later Icarians there, were typical of such groups, which featured common ownership of land and buildings; equal pay for all labor was also usual. Somewhat similar to these were several planned communities. 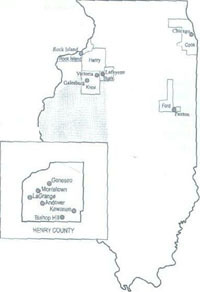 Henry County attracted five New England planned colonies in the 1830s — eventually the communities of Andover, Wethersfield (later Kewanee), LaGrange, Morristown, and Geneseo. The Swedish group was scarcely unusual, then, as it headed for the Illinois frontier to launch a new society. Janson — he dropped the second s from his name upon reaching America-arrived at New York City in June 1846 with148 others including his wife and two children. Some facets of Janson's theology had already begun to unravel: the prophet had said that his followers would not get sick en route; they would immediately be able to speak English when stepping on American soil. Neither prediction proved accurate. Ten members abandoned the group in New York, twenty-seven in Chicago. When they reached Bishop Hill — so named by the prophet after his birth place — the Swedish travelers may have found a paradise of Nature, but Nature had made no provisions for human habitation. During their first winter, they lived in dugouts gouged from the sides of ravines. The colony's church served as housing after its construction in 1848, as new immigrants further boosted the population. Such crowding aided the spread of cholera, which hit Illinois with virulence in 1849 and killed 143 Jansonists in three months. The population that had grown to 800 in 1847 fell to only 406 for the 1850 census. Land purchases continued, however, and the 1,420 acres owned by the colony in 1850 grew to 12,000 acres by 1860. Bishop Hill quickly became a communal society. "[W]e have contributed all our belongings to this commonly owned property ..." a colonist explained. And so they lived and worked together, following a course they believed was taken by the early Christians. This attracted attention around the area, and Bishop Hill began to draw visitors. One observer told of seeing fifty men cultivating a two-mile-long cornfield, and fifty milkmaids milking 200 cows. Not all labored in the fields. Others followed such trades as shoemaking, or brickmaking, marketing, or buying. The daughter of a colonist later recalled that "Certain tasks were for those in the prime of their strength. Other tasks were for the aged or feeble, or for the boys and girls." But everyone had a job. A writer who studied the colony soon after its decline concluded that the Jansonists had more comfort and security than the pioneers settling around them. This drew attention, and a colony member explained, "The Americans come in droves to see how we have it, and it surprises them that we can live together like this." deceived by the devil, " he told one challenger, who promptly left to join a group of defectors at nearby Andover; many others went to Galesburg, Victoria, Lafayette, and Chicago. This refusal by Janson to accept any challenge to his leadership ran into severe trouble in the case of John Root, a Swedish wanderer who had married Janson's cousin Charlotta Louisa at Bishop Hill in November 1849. Root left to resume his wandering, returning later to urge Charlotta and their baby boy to flee the continuing cholera epidemic. She refused, setting off a complex series of events as she and the child tried to hide and flee, aided by Janson. During a recess in the resulting lawsuit, Root fatally shot Janson. Root received only a two-year prison term, and Governor Joel Matteson soon yielded to popular sympathy and pardoned him. Charlotta obtained a divorce in 1853. Rather than being destroyed by these events, the colony at Bishop Hill began its period of greatest prosperity as the communal system adapted to varied economic endeavors. A Swedish engineer who visited in 1856 admitted that "Erik Jansson ... was possibly a great prophet but certainly no economist...." He noted that under new leadership the colony grew until it had hundreds of horses, mules, oxen, and cows — "I have never seen so many pigs in one place as I have here" — plus a thriving broomcorn project that brought $36,000 in broom sales in 1854. Flax thrived on the prairie, and the colony annually produced thousands of yards of linen cloth and carpeting. Carriages, wagons, and bricks were manufactured for outside sale. Within the colony a dozen substantial brick buildings were erected, including "Big Brick," a dining and residence hall hailed as the largest building in America west of Chicago, and the area's only hospital. Food was abundant for the colonists. But it was not to last. First came the nationwide financial panic of 1857, which left strings of bankruptcies across Illinois and devastated Bishop Hill, which had over extended credit to purchasers of its products. Several members had been expelled over the years, but now dissension increased sharply. Some called it "Bishop Hell," and began agitating for a division of the community's assets. Dissolution occurred in 1861, and many residents now settled on their own farm plots carved from the colony's extensive holdings, or on town lots in nearby Galva, Some continued to live in apartments at Bishop Hill. Many joined the Methodist, Baptist, Second Adventist, or Swedish Mission churches. Over the years clusters of Bishop Hill folk moved west to Kansas, Nebraska, and Iowa. Many gave up the communal system reluctantly and gradually, and did not criticize it. The Bishop Hill settlers had established a beachhead for Swedes in Illinois. Their letters detailing the advantages of both prairie soil and American freedom stimulated new rounds of Swedish emigration. The Illinois Central Railroad quickly saw Swedes as potential purchasers of its lands in the 1850s and 1860s, publishing thousands of Swedish advertising pamphlets and even dispatching an immigrant back to the homeland to recruit buyers. The railroad eventually helped Augustana College develop at Paxton. (Later it was moved to Rock Island). Although life became less harsh within Sweden as reforms were instituted, emigration had become an accepted activity and was no longer a subject of scorn. A severe famine in the late 1860s further encouraged the exodus, and the resulting "swarming of the Swedes" helped many Illinois communities boom, including "Swedish Town" on Chicago's north side. By 1890 Swedes formed close to 10 per cent of Chicago's foreign-born. By that time there were many heavily Swedish towns across the state. Swedes had become an important part of Illinois' population, due in part to the initial thrust onto the prairie of a small group of religious dissenters.